I know what you're thinking. Another new person? Are we running a halfway house here? Jack (aka LoserPoet) has been writing his own blog for a few months now called Shooter's Lounge, named for one of the greatest closers to ever don the Cubs uniform, Rod Beck. Jack wrote his virgin post at the Saloon the other night, and if you haven't read it, there's no denying the guy is a die-hard Cubs fan. Aramis Ramirez, Carlos Zambrano, Geovany Soto, Kerry Wood, Greg Maddux, Derrek Lee, Jason Bay, Vladimir Guerrero. Mark Grace, Rod Beck, Andre Dawson, Bill Buckner, Roberto Clemente, Benito Santiago, John Kruk. Can't say as I've met any. I did talk briefly with Steve Stone when he was signing autographs at a Chiefs game a year or so ago, but it wasn't really in the category of memorable. The Shooter. He was one of a kind. 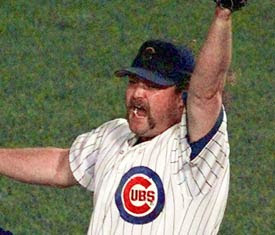 I'd also love to get stinkin' drunk with Mark Grace and Kerry Wood. I'd probably wake up naked in a cardboard box somewhere in Canada, but it would be worth it! Jim Edmonds has moved off the list. As soon as he retires, I imagine he'll move back on, unless, of course, he hits the game winning home run to win the World Series for the Cubs. In that case, he's earned immunity. Oh, and Joe Morgan counts, right? Douchebag. Bases Loaded for the original NES. That was the last video game system I ever owned. I cut my teeth on my grandfather's Pabst Blue Ribbon, but currently I'm a devotee of Coors' Light. If I'm feeling fancy, I'll buy some Lowenbrau or Red Stripe. I stopped drinking hard liquor when I ran out of money for new pants. That demon rum was awfully tough to give up. The pirate on the bottle still talks to me . . . Honestly never heard of them. Bill Buckner rookie card, Greg Maddux rookie card, Goose Gossage rookie card. Ketchup on a hot dog. Yay or nay? Just so long as there's mustard and relish with it, I say yes. Who do you consider your nemesis? If you could be any movie character, who would it be? The Dude, from the Big Lebowski. If I hadn't gotten married, I wouldn't even need to pretend. Favorite thing you've written for TMS or something else? I like my post on The Shooter's Lounge calling out the little wiener on the Chiefs who threw that ball into the stands. I also like the post I wrote about Rod Beck for his birthday. Not too shabby . . .
Thing you've written you're most ashamed of? Some of the Mustache posts on The Shooter's Lounge are pretty bad. But, hey, it's a talking mustache. It only gets so good. Would you touch Kyle Farnsworth's weiner if it meant a Cubs World Series title? What's your dream baseball lineup? C-Geo Soto. I love this guy. SS-Jeter. He's really unlikable, but damn, he got game.